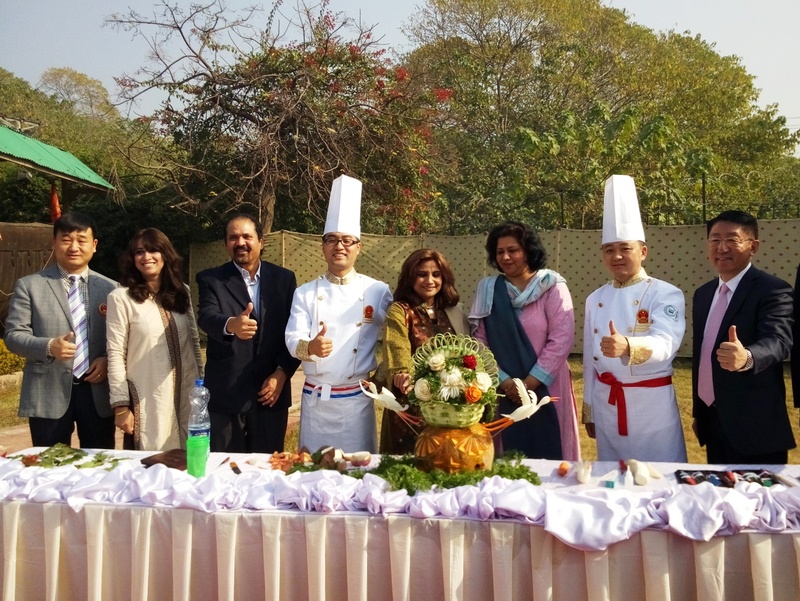 ISLAMABAD – Flavorsome, rich and colorful Chinese cuisine prepared by master chefs from China at the Food Carnival was as much delicious as visually appealing. 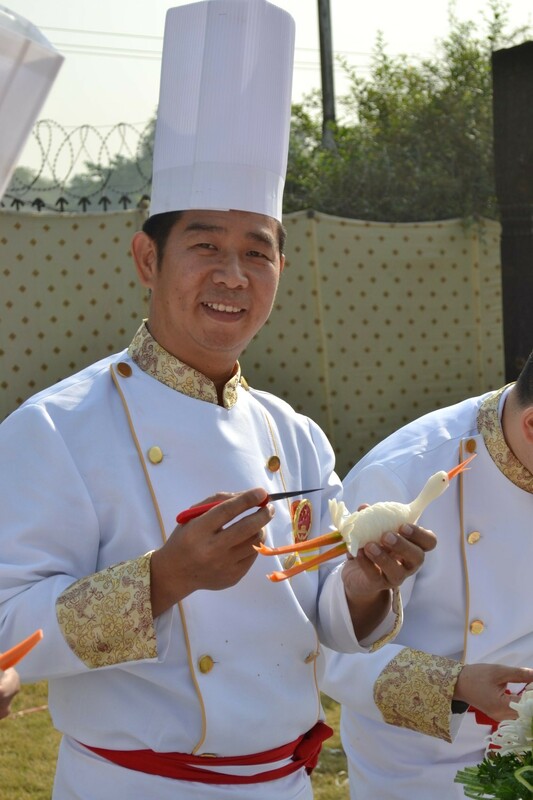 With their exquisite meals, exceptional culinary and food carving skills, top Chinese chefs offered Pakistani guests more than just food, as authentic Chinese cuisine is also a form of art and a powerful cultural expression. Chinese Food Carnival in Islamabad was organized by China Radio International (CRI) to promote the culture of our neighboring country in Pakistan. The delegation of 5 culinary masters sent by CRI, along with Mr. Bian Jiang, vice president of the China Cuisine Association, were joined by a delegation of Mr. Gao Bingyi, Chairman of Famous Chefs Professional Committee of China Cuisine, at the Lok Virsa food carnival in Islamabad. “The delegation of 40 people includes 20 master chefs who have come from different regions of China bringing a variety of cuisines for the Pakistani people”,told Mr. Gao Bingyi. The chefs fascinated the audience with their culinary proficiency and splendid dishes. From seafood to chicken, from rice to mutton, and bread to vegetable dishes, a variety of food was prepared by chefs. Rice and paratha was also offered on the menu to suit the appetite of Pakistanis. “I liked the Kung Pao Chicken best” shared Ms. Hina Anwar, Programme Executive at Pakistan Monument Museum. Sichuan Cuisine – famous for its hot and spicy flavor – is one of her favorite Chinese cuisines, she said. With long history, unique features, variety of styles and exquisite cooking, Chinese Cuisine is a significant part of Chinese culture. “Chinese cuisine is deeply rooted in history and is one of the richest and most diverse culinary heritages in the world” said Mr. Bian Jiang. “Pakistanis love to cook food, eat food and serve food” and absolutely enjoy eating Chinese as well as other continental dishes, remarked Ms. Shahera Shahid, Executive Director of Lok Virsa. The popularity of Chinese food in Pakistan is quite evident from the large number of Chinese restaurants in all major cities, she said. Apart from food, Pakistan and China also share similarities in arts and crafts which can be seen in a number of Pakistani crafts. The Chinese food festival is an expression of love and association with the Pakistani people as food has an important role in Chinese culture, said Qianting Wang, CRI’s senior correspondent in Urdu service. 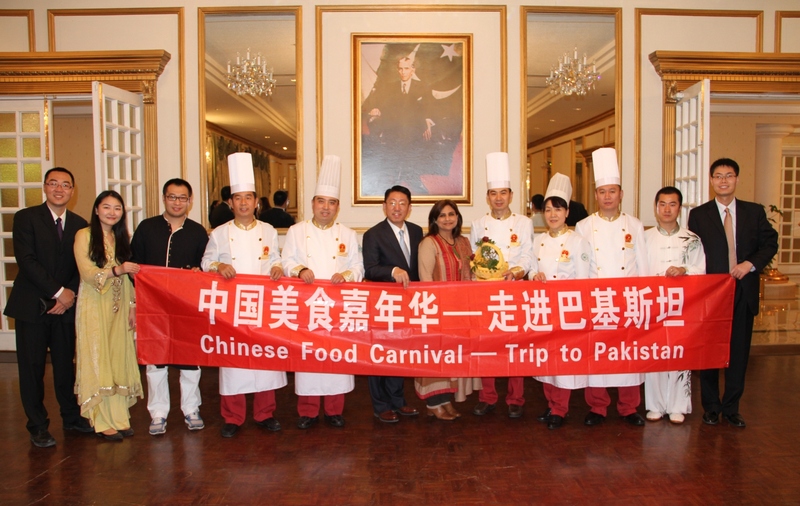 The food festival is a new initiative by CRI to promote cultural and economic relations between Pakistan and China, and to extend its decades’ old efforts of promoting spirit of love and understanding at the peoples’ level, informed Ms. Qianting whose Urdu name is Musarrat and is a fluent speaker of Urdu language. CRI’s Dosti Channel FM-98 which broadcasts in Urdu and English is aimed at forging stronger cultural bonds between the two peoples. The delegation is visiting Pakistan for one week to coincide with the celebrations as the year 2015 has been declared as the Pak-China Friendship Year. The food festival was an occasion to introduce authentic dishes from farthest parts of China and also a chance to forge and strengthen business ties. Dr. Erfa Iqbal, Commercial Counsellor, Embassy of Pakistan, prompted for food diplomacy to bring Pakistani and Chinese people close and strengthen current bilateral relations between the two countries. Group photo of Chinese delegation with Pakistani officials. The opening ceremony of the food carnival was held at Centaurus Mall, followed by a special food evening at Marriott hotel. The chefs then went to Prime Minister’s House where they were greeted by Ms. Maryam Nawaz, and also made an appearance on the state-run TV channel. Chinese chef demonstrating food carving skills.